Remember the freedom and adventure your bike gave you as a kid? 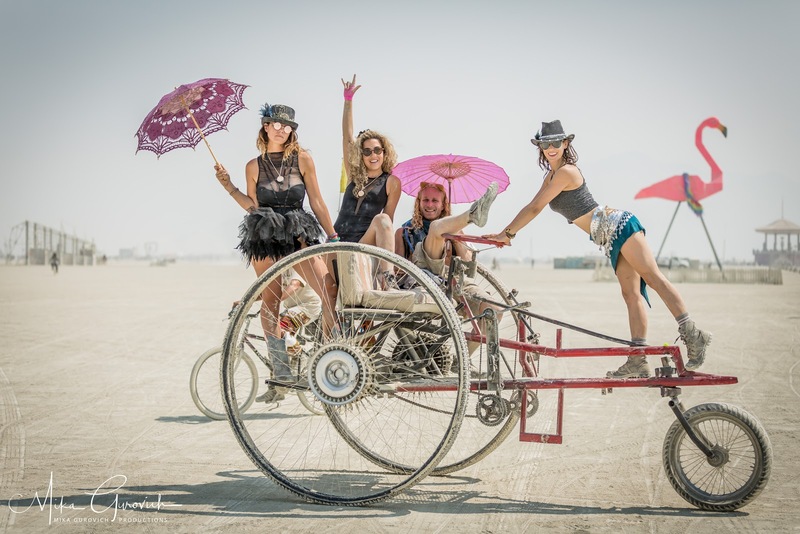 Having a bicycle at Burning Man gives you those feelings x 10. Black Rock City is now more than 8 square miles, so a bike is pretty much a necessity for your overall enjoyment, unless you plan to embrace your introvert tendencies and just hang out at your camp. With more than 90% of Burners getting around by bicycle, Black Rock City is the most bike-friendly city in the world. But a bike is more than just transportation, it’s an experience all on its own. Imagine biking across the playa, the wind in your face, dancing on your pedals to music you hear as you bike past the camps. A speck on the horizon transforms itself into an amazing piece of art as you get closer, and then finally arrive. You ride your bike around the art, seemingly the largest sculpture you’ve ever seen. At night, cruising past spectacular illuminated art and lights and mutant vehicles is an experience you won’t get elsewhere and your bike doesn’t just transport you on your journey; it enhances it. What Kind of Bike Should You Bring? Most importantly, you need to bring a bike that can make it through a test ride back home. It’s best to find a used bike that you can decorate and adorn with lights that you’ll clean up and store along with your gear for the next Burn. If you can’t swing a dedicated bike for the Burn, that’s okay – just be warned that the desert will be hard on your bike, so don’t bring your $4000 bike, and plan on extensive playa dust clean up and care to halt corrosive effects. Bikes can be divided into categories: beach cruiser, hybrid, mountain, or road. The majority of bikes on the playa are beach cruisers and mountain bikes, followed by hybrids. The playa surface can be uneven, rutted, or deep and soft. Don’t bring a road bike to the playa. (In most cases, the tires are too narrow for the playa conditions). People choose cruisers because they like the style, simplicity, and sitting upright. Mountain bikes and hybrids tend to be lighter and better for long distances and heavy loads. Keep in mind that playa dust is hard on cables and cable housings. Many veteran bike enthusiasts suggest it’s wise to avoid brake or gear systems that use cables. While you do not necessarily need multiple gears for the flat playa surface, if you want those gears for a nicer ride, consider minimizing the amount of cables involved. Wheels with 3 speed internal hubs offer the best of both worlds. Shocks in general are bad. Well, they’re great on your $3,000 mountain bike, because they are real shocks. In contrast, the shocks on cheaper bikes will fill with playa dust and freeze, making them about as useless as glitter. Don’t be fooled! Unfortunately, department and big box stores love to sell mountain bikes that look like high end bikes, with fancy gears and shocks, for about $100. Unfortunately, the components are awful, and the people assembling the bikes are either poorly trained or not trained at all; hard to tell. The vast majority of bikes we see at the repair camps are department store bikes with gears. Most of them don’t even last the week! You take A, B, or C. Absolutely NOT “D”, as in “Department Store Bike with Gears.” In fact, we made it option “D,” so you’d remember it as a failing grade. Cheap bikes with gears are so bad, we should have made them option F. Avoid at all costs. Even if it’s free, avoid it. Re-use is best. Start looking on your local Craigslist and Burner community Facebook pages for a used cruiser or mountain bike with good tires. Also put it out to the universe that you’re looking – you’d be surprised how many people find their playa bike through word of mouth; Burners help Burners. Also ask if your local bike shop has consignment services. No luck near home? Reno Bike Project (RBP) sells recycled bikes intended for the playa starting at $60. These bikes have at least one gear, one brake, and tight bearing surfaces. RBP also offers a full range of accessories and services, including last minute repairs for people rolling through Reno and bike assembly for people who want to ship their bike to Reno. Kiwanis Bike Program in Reno has affordable bicycles for purchase as does Black Rock Bicycles, operated by Burners. Here is a rundown of bike shops local to Black Rock City and Reno that specialize in Burner bikes and services. Try to avoid getting a cheap-in-every-way new bike from one of the big box stores that might barely last the Burn and then end up in the landfill. Consumption and waste is hard on this planet. You can also rent a bike for the Burn. Playa Bike Repair has rental bikes available that you reserve ahead, online, and then pick up at their camp when you arrive in Black Rock City. 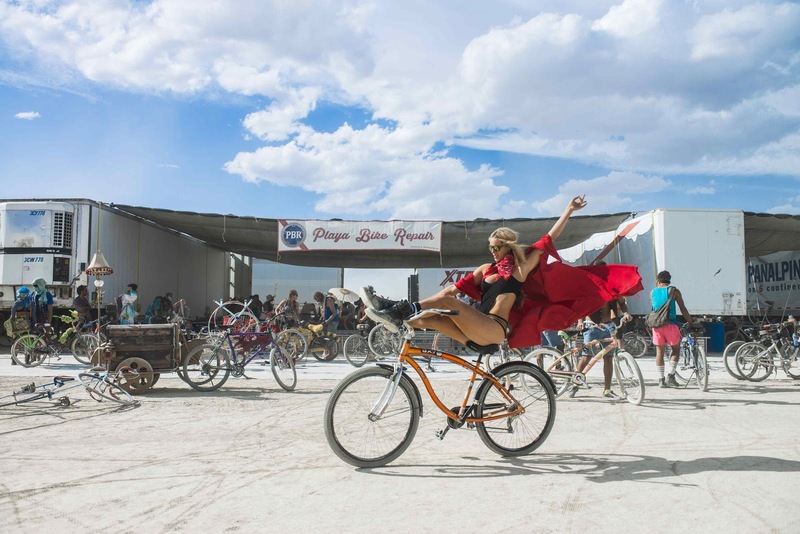 Besides the convenience of not having to prep, tune, pack, and then de-playa your bike, you can feel good about the fact that your rental fee helps pay for free repair service and parts – PBR repairs more than 4,000 bikes each year at Burning Man. Reserve early: the prices go up in tiers as the event approaches. Hammer and Cyclery is another on playa rental and repair organization. They also operate “More Than a Bicycle,” a nonprofit that repairs and sends donated bikes to Gambia, Nigeria and Togo Africa to provide affordable transportation options to those in need. Just eight miles from the playa Burner Bikes LLC rents bikes at affordable rates, but reserve ahead because they do run out. For information, email them at burnerbikesllc@icloud.com. 1. Lights: Putting a light on your bicycle is crucial for safe travel after dark. (Civic Responsibility) Being a “dark wad” while you’re walking at night is mostly dangerous for you. But if you’re on a bike at night without lights, you are a hazard to everyone (walkers, bikers, and cars). At a minimum, put a light on the front of your bike and reflectors on the wheels and back. Consider adding a colored string of luminosity or two. They not only enhance the experience of others but can help friends find you and help you find your bike in the sea of them outside after Tyco plays. If you lose your bike light or the battery dies, ride with your headlamp (another mandatory item). 3. Functionality: Test out your bike before you come to the playa. (Radical Self-Reliance) Make sure that your brakes work (or at least one) and that your tires aren’t brittle, aren’t cracked on the sidewall, and hold air. It’s a lot easier to fix your bike at home than in the middle of the desert. There are very few repair camps at Burning Man, the lines are long, and their parts are extremely limited (some don’t have any parts at all). Furthermore, while the volunteer mechanics enjoy helping people, they have neither love nor tolerance for Burners who show up on the first day with a broken bike that was obviously broken pre-Burn. 4. Extra Inner Tubes: Even if you’re not doing tricks on the Bike Course, flat tires happen and will cripple your bike. Bring extra inner tubes in your size (this is particularly key if you have a non-standard wheel size), basic tools, and know how to change your tire. Yes, you probably can get help, and yes, some of the bike repair camps could patch it and may carry tubes, but they almost always run out of the most popular tube size and don’t always carry the odd ones (that especially includes kids bikes, trikes, tandems, fat tires, etc). 5. Identification: Make it possible for your bike to be returned to you if taken, mistakenly or otherwise. Put your name, camp, playa address, and email address on a luggage tag or on paper and tape it to the bike. If it’s your own bike, use a sharpie, and write on the frame. Everyone is an artist and can contribute to making Black Rock City beautiful. (Radical Self-Expression) Participate in the BRC art scene by decorating your bike. Your bike can become a mobile sculpture or can show off your kooky personality. Use your imagination – anything goes as long as it’s not moop fodder. An added bonus of a unique bike is that it will be easy to find in the rows of racks (especially at night if you incorporate lights in the design) and will be easily identifiable if it does get taken, therefore, more likely to be spotted and returned to you. Get a basket, or rear rack. We prefer to carry all our belongings in a pack, because when we arrive at a camp, we can simply lock the bike, grab the pack and go. A milk crate on a rear rack is great for transporting your pack (bungees across the top make it extra secure) and for your ice runs to Arctica. Put a tennis ball on your kickstand. Make a little hole in a tennis ball and put it on the end of your kickstand to keep your bike from falling over. Get a bell or horn. Don’t use it to be annoying, but there are plenty of times that you want to alert someone that you are approaching or warn them. Safety first (and second and third). If you’re looking for a one way ride, Black Rock Community Transit runs and operates the Yellow Bike Program. (The bikes are actually bright green but about as yellow a green as you can get without actually being yellow). Yellow Bike builds 1,000 bicycles every year and deploys them for free use for all on the playa. You can identify the bikes by their green/yellow color and they also have “YELLOW BIKE” stenciled on them. Community bikes are meant for everyone to share and are for short rides only. Yellow Bike rides are just a one-way guarantee and must be placed in a visible, common public place where they can easily be found, and never brought into your camp or locked (your lock will be cut off). It takes a Communal Effort to keep this great program going. Here are more rules about using Yellow Bikes. Don’t leave your bike behind when you strike your camp – a bike is a big trace. 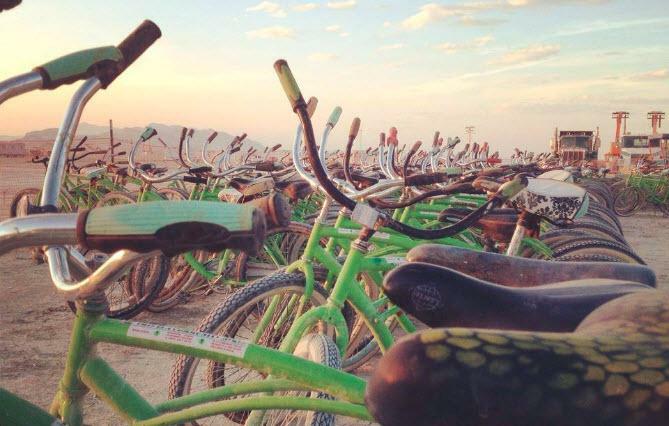 Last year 3,754 bicycles were abandoned on the playa after the Burn, causing weeks of additional work for Black Rock Community Transit and others. If your bike is in good shape but you don’t want to take it home, Hammer & Cyclery operates a donation station near the exit. There are numerous other donation stations in Lovelock, Fernley, Sparks and Reno that can reuse your bike for sale or parts, many benefiting charities. Whatever you do, don’t abandon a bike in Black Rock City. 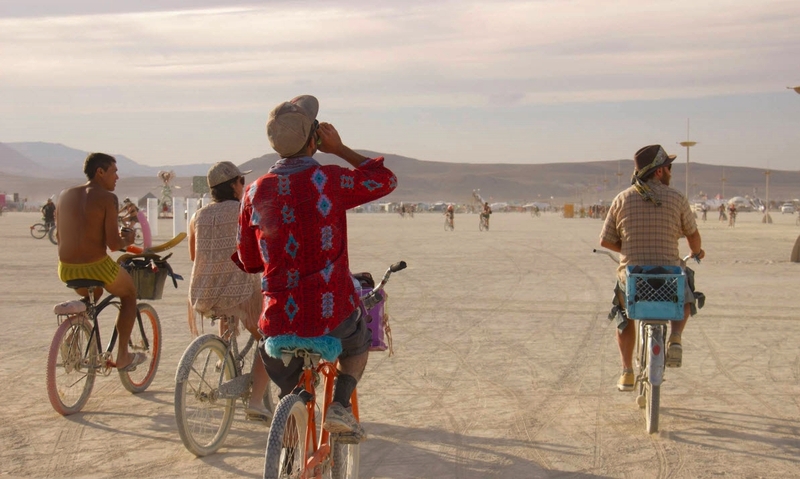 We often hear that people have so much fun biking at Burning Man that they go home and take up biking again or become more active in their local biking community. Biking reduces your carbon footprint and can improve health and happiness. Bring the camaraderie and bike love you get from the Burn home with you to the streets, paths, and trails where you live the rest of the year. My personal preference, besides adorning my bike with glittering/flashing lights, is to carry a small hand-held LED flashlight that I can shine anywhere at my discretion. Most of the time I shine it forward, but occasionally I’ll spot dark movement out of the corner of my eye and can quickly shine the bean to illuminate the dark wad in question. But, yes…for sure, some kind of forward illumination…and rearward, too, for that matter. Wouldn’t a camp offering rental bikes be a bit against the 10 principles, specifically the “transactions” part of decommodificaction? I’m not the one to speak officially, but having previously worked for PBR before, it’s better perhaps to consider the ‘rental’ fee as a donation towards storing & maintaining the many playa-ready bikes that have to be kept year round between each burn. this service is vital to the experience at burning man. transport to/from the desert is a cost, as well, that has to be subsidized. no transaction takes place on the playa. All transactions for people renting bikes with PBR (and other providers) happen pre-playa. Those who have rented from PBR are known to PBR, and PBR hands them a bike on-Playa with no money transacting there. Thus, PBR conforms to the decommodificatios principle the same way as with many, many commercial items provided on the playa – fuel, bulk water, bulk greywater disposal, storage containers (including that from BMorg itself in addition to others) – by doing it off-playa. This is the reality of the burn, and no different from people spending money at Big Box™ pre-playa. The only difference is where the product is received. hey jay, long time no see (except on FB). Disappointed that they spelled Tycho wrong. That is all. Ugh! You’re right, Justin! That was me. I definitely know how to spell it AND I’m an editor. I didn’t notice the typo. :( I did notice some comma errors where I changed copy in a hurry and should have re-read. The Tycho is worse. Department of Wonder and Siren Salon, both part of Wonder Camp, is located at 4:30 and Hal this year. We repair bikes and tired Burners! I got a sweet free n fancy mountain bike to use in the desert this year (yay) but it of course has cables and shocks (booo). While I plan on using it only in BRC, any tips on cleaning it when I get home – both the cables and shocks – would be super appreciated and helpful. I’ve heard differing opinions on using the standard vinegar concotion to clean it. What says you, smartypants bike babes? Spanks! How do I get a hold of the three sisters of the amazing Siren Salon ?? ?